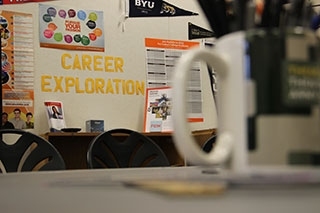 High school is a great time to start exploring what you are passionate about and how you would like to put that passion into action with your future career. Del Oro students have many opportunities to identify what their interests and abilities are through athletics, clubs, leadership in the school and out in the community, and programs such as ROP or Future Farmers of America (FFA). Deciding on your future career is not a quick thoughtless decision, in the College and Career Center we will assist you in the steps that are necessary when exploring career options. Stop by the College and Career Center, room 204, during lunch or after school to meet with a counselor. O*NET Interest Profiler is a helpful site that will help you find what your career interests are and what your Holland's code is (RIASEC), which lists in order what your personality traits are based on your answers. O*net uses the Holland's code to match you to career industries and specific careers for further exploration. Big Future is another online tool that can assist with discovering career options and associated college majors,. Step away from the computer and reach out to professionals in the career of interest. Set up and informational interview, job shadow, Take a CTE, Dual Enrollment or Sierra College course, apply for an internship, come to career presentations on campus. Stay open-minded; resist the expectation that you should have a career well planned out already. You have all of high school, college and beyond to decide what career is best for you. Don't be afraid of uncertainty and failure. Remember if something doesn't work out at least you have gained new knowledge and self awareness. Gather information and advice from others. Listening to others perspectives is beneficial in decision making, filter through the information as it relates to what is important to you, not what you think you should do. Created by the Department of Labor, these two sites below are used to research careers, wages, employment outlook statistics, and more across the united states. Jobs For Teens - this site focuses specifically on helping teenagers find jobs and it's 100% free to use.It has very useful information including work permit requirements, labor laws, jobs for teens by city/state, job ideas, jobs by age, and more. These Websites can be used for more career exploration, learning and matching your personality type to careers, etc.